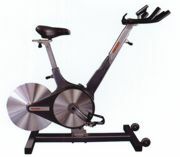 One of the hottest items in the cardiovascular training section of the ‘08 Perform Better catalog is the Keiser M3 Indoor Cycle. Because of its magnetic flywheel drive, it offers a smooth (no friction) ride that truly replicates an actual bike ride. The unit has a feature that lets the rider know how much power he is putting out. This rugged unit is virtually maintenance-free. It incorporates a built-in computer that also measures RPMs, trip distance, trip time and heart rate. Redesigned for more versatility, the Dirt Doctor now includes a detachable finish drag that can also be pulled by hand for "between innings" grooming. The Dirt Doctor by Newstripe is truly the ultimate baseball diamond groomer. The Dirt Doctor plows, pulverizes, drags, rolls and final-finishes the field. Plus, with four models there is a Dirt Doctor to fit your tractor and budget. Time-saving features include: modular hitch design, tow package, harrow bar, pulverizing bar, lift jack, center grating, roller and finish drag. Designed to last for years, the Dirt Doctor is manufactured from all structural steel and the finest components, guaranteeing durability. Develop the core, proprioception and kinesthetic awareness with the Functional Training Board from Power Systems. This multiplanar instability training board offers several settings to allow users of different abilities to perform standing, seated or lying exercises. To further enhance the workout, incorporate tubing using the notches around the base or add in medicine balls, weighted bars and dumbbells. For multiple pushup positions, use the raised handholds on each side. Programs strapped for space or budget can get the basic features of Bison's larger T-Rex 96 portable basketball system on a compact T-Rex 54 SR that fits into gyms where others won't. T-Rex 54 SR has an official 72-inch glass backboard with lifetime warranty, breakaway goal and DuraSkin backboard padding. The 54-inch safe play area allows the base to be six feet outside the endline of an official court. Base and front are fully padded. All padding, including DuraSkin, is available in 16 colors. Front post and base lettering are optional. Balanced Body introduced a turnkey solution for commercial fitness facilities ready to begin a Pilates program or train existing staff. With new training and equipment packages, Balanced Body offers combined instructor training and Pilates equipment for one low cost per person. The packages allow commercial facilities to train instructors on-site and receive equipment starting from $1,194 per instructor. Ideal for clubs introducing a new Pilates program, training and equipment packages include training for eight instructors on equipment such as the Allegro Sport, Allegro Reformer, Allegro Tower Retrofit and Pilates mat. Training packages for clubs without a need for equipment also are available. Fabcote now offers a line of ladders and rails for commercial aquatic athletic centers including a complete line of powder-coated rails to match facility décor and protect against corrosion. Fabcote's state-of-the-art, in-house powder-coating facility produces an exceptionally durable finish to resist corrosion. The surface of the rail is evenly coated using an electro-static process that drives the coating material into and around all surfaces. Fabcote rails are made of high-grade 304 stainless steel. Quaker Plastic Corp. announced the addition of several new items to its line of Water Hog® deck drains. In addition to its popular 3-inch size, Quaker has added a new 4-inch size—ideal for commercial aquatic facilities. Plus the Water Hog® drains are now available in tan, gray or white to match the latest in decking treatments. Water Hog® deck drain is made of all-weather PVC, mounts flush against the pool wall and comes packed with tops, base screws and connectors ready for installation. The Water Hog® can handle more water volume than traditional deck drains and truly avoid clogging problems associated with traditional drains in commercial aquatic applications. Plastimayd Corp. announced that all of its safety covers now include free commercial-grade hardware. This commercial-grade hardware is especially important to commercial aquatic applications, where pools are larger and liability is a huge concern. The new commercial-grade, ultra-sonically hardened anchors and exclusive double-tension commercial-grade springs combine with Posi-Lock buckles, which give covers unsurpassed deck-anchoring strength. Plastimayd even includes a commercial-grade tool for fast and easy installation and removal. All custom covers ship within eight days—guaranteed and are also available with faster rush service.